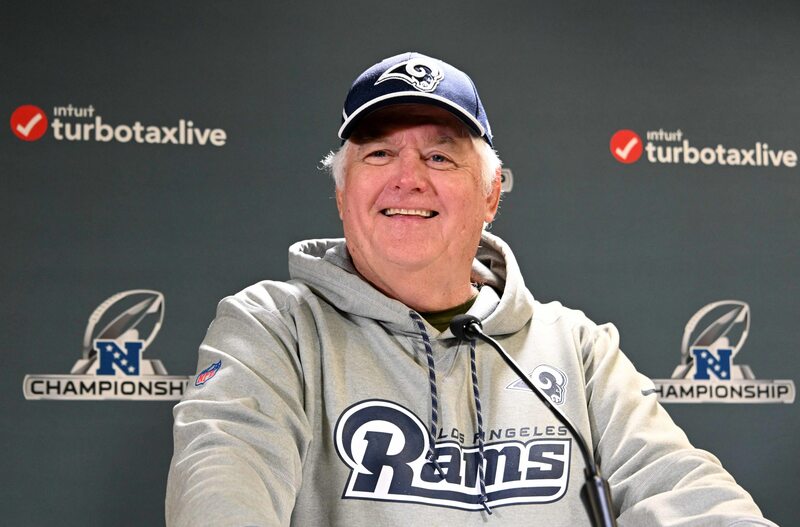 Wade Phillips stands alone as the biggest threat to six championships for the New England Patriots when the Los Angeles Rams take on the dynasty in Atlanta during Super Bowl 53. Brief introduction: For those casual viewers who might not be familiar with Phillips’ role, he’s the defensive mastermind in Los Angeles. Son of the legendary Bum Phillips, Wade Phillips has been a defensive coach in the NFL dating all the way back to 1976. He has also served as a head coach in the NFL, posting a career record of 82-64. He left Denver in 2017 to join young Sean McVay’s staff as the Rams’ defensive coordinator. Rams are hot: In the two playoff games this year so far his influence has been key to the team’s overall success. Dallas and New Orleans — two top-10 rushing offenses during regular season — gained a total of 98 yards combined against Los Angeles in the wild-card and divisional rounds. The great Drew Brees struggled in the NFC title game as Phillips’ scheme masterfully took away his greatest weapon — receiver Michael Thomas. In the wild-card game, Dallas managed to convert just 1-of-10 third downs as Los Angeles continually forced third-and-long situations. History against Bill Belichick: There aren’t many coaches who can claim to have success against Belichick. Phillips has come as close to that as anyone. Since 1981, Belichick has a narrow 17-16 advantage over Phillips, per John McClain of the Houston Chronicle. Since Belichick became the head coach in New England, the Patriots have gone 6-4 against teams coached by Phillips. Considering the Patriots have won 74 percent of their games in the Belichick era, it’s clear Phillips has an understanding of how to take on the genius. What Phillips will do: In Super Bowl 53, Phillips must take away New England’s strengths. The same run defense that held the Cowboys and Saints to 98 yards will focus on keeping Sony Michel in check. He’s been a nightmare the past few weeks. Look for Dante Fowler Jr. to get some help from linebackers and safeties on timely blitzes. Shutting down Julian Edelman is priority No. 1 in the passing game. He’s Tom Brady’s most reliable weapon, and if he’s a non-factor the Rams will win.